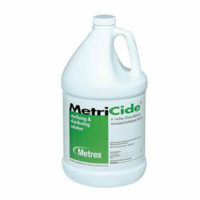 A 2.6% buffered glutaraldehyde that can be used and reused as a sterilant and high-level disinfectant on immersible lensed and delicate instruments for up to 14 days. Safe for use on lensed instruments, and is compatible with plastic, rubber, metal and other material used in medical and dental instrumentation, and equipment requiring disinfection or sterilization. No dilution is required. 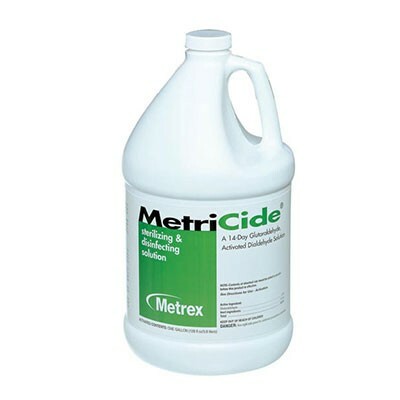 MetriTest™ 1.5% Test Strips are a glutaraldehyde concentration monitor for use in glutaraldehyde-containing germicide solutions with a minimum effective concentration (MEC) of 1.5% glutaraldehyde. It is recommended to test the glutaraldehyde solution prior to each use to help prevent healthcare-acquired infections (HAIs).